Light photography of an ostracod, side view and top view. Ostracods (Class Ostracoda) are a diverse group of small aquatic crustaceans, usually around 0.3 to 5 mm in length. Their most distinctive feature is their calcitic carapace; a hard, bivalved, hinged shell that can entirely cover and protect the non-mineralised body parts and appendages. Many ostracods have smooth rounded shells, hence their common name, seed-shrimps, while others are ornamented with pits, striations, spines, ridges, flanges etc. 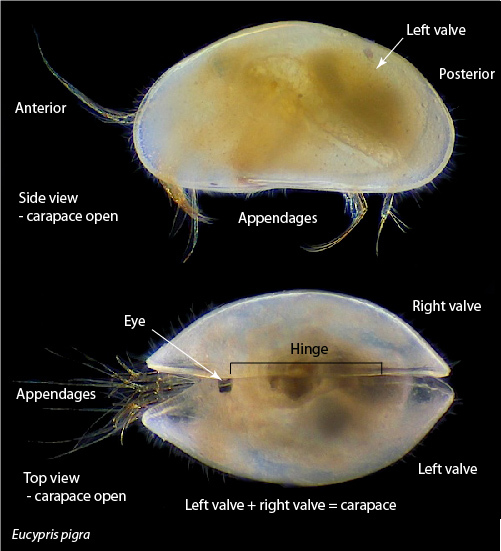 Inside the carapace ostracods have a complex body consisting of typically eight pairs of appendages, which have a range of functions including swimming, sensory, crawling, feeding and mating. When the shell is open, the appendages are extended through the gap for locomotion, feeding and mating. Most ostracods are small enough that they can respire by absorbing oxygen directly from the water through the cuticle of the body. 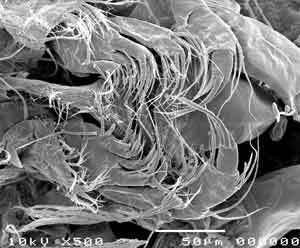 The carapace can hinder water flow around the body, so to overcome this, ostracods have a large, feathery branchial plate on the maxillula (and sometimes smaller ones on the mandibles and thoracic appendages) that is rapidly moved to create a current of water through the valve opening. Some of the larger marine groups, however, respire with gills. Most ostracods have a single eye consisting of three fused cups, situated near the anterior end of the hinge, just above the base of the antennules, but in some groups this is differentiated into two distinct halves connected in the middle, producing a dumb-bell shape when viewed from above (e.g. in the Notodromatidae). Other groups have a pair of compound eyes situated laterally in addition to the single dorsal eye. In hypogean species (subterranean species), the eye can be reduced or absent. Scanning electron microscopy image of an ostracod with the right valve removed, revealing the appendages inside the shell. Antennules used for swimming (only some groups), crawling and sensory (both chemical and tactile). Antennae used for swimming (only some groups), crawling, sensory (chemical), copulation and feeding (moving food to mouth). Mandibles used for feeding (moving food to mouth and mastication). Maxillulae used for feeding (moving food to mouth) and respiration. Fifth limbs uses vary between groups from feeding (moving food to mouth), copulation, or walking. Sixth limbs used for walking. Seventh limbs uses vary between groups from cleaning, walking, or climbing. Caudal rami (absent or reduced in some groups) used for locomotion, and copulation in some groups. Ostracods reproduce both sexually (most marine forms) or asexually (many freshwater forms). One group of ostracods, the Cypridoidea, reproduces using giant sperm, which can be longer than the male; the longest ostracod sperm on record is 11.7 mm in length, 3.6 times the length of the male. The sexual apparatus is complex in this group, and includes large muscular pumps, called Zenker organs, used to transfer the sperm to the female. Everything is paired, so the male has two Zenker organs, eight testes (four on each side) and two penises. Asexual species are common in freshwater habitats, mostly of the family Cyprididae. Populations consist of only females, and they produce clones of themselves in a process called parthenogenesis. 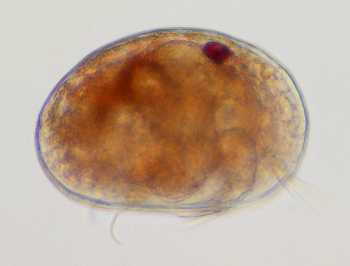 The first instar of an ostracod. While it only has three pairs of appendages, it still has a bivalved carapace. The dark red spot is the single eye. Ostracods typically have eight juvenile stages and one adult stage, called instars. Ostracods show direct development, meaning that they don't metamorphose during development, and the earliest instars look somewhat like adults, albeit much smaller and with fewer appendages. The first free-living instar that hatches from the egg has the antennules, antennae and mandibles, and in some groups an incipient caudal ramus as well. As the ostracod moults, additional appendages are added, and the existing appendages become more developed. Ostracods can be found in most aquatic environments, including the sea (from the depths through to the shores), rivers, lakes, ponds, rice fields, small pools and puddles, groundwaters, springs, and wet leaf litter. Some marine ostracod groups are planktonic, but most groups either live on or near the bottom, on submerged plants, or on sediments. They can also be found in sediments, living in the tiny spaces between sediment grains (interstitial), and a small number are neustonic, spending time up-side-down at the water surface. One group, the family Entocytheridea, is commensal with other crustaceans, mostly crayfish, living on the gills and appendages of their hosts. Planktonic ostracods are capable swimmers, while other groups can swim to get from place to place, but spend most of their time on the sediment surface. Many can't swim however, and crawl to get around, using their antennae and thoracic limbs. The mouth parts of an ostracod. There are approximately 33 000 fossil and living species of ostracods so far described, but there are many more yet to be discovered. It is estimated that the total number of living species is between 10 000 and 15 000. Because the calcified carapace readily fossilises, ostracod are the most abundantly preserved arthropod group in the fossil record. They first appeared in the Ordovician Period (485 to 443 million years ago), and colonised freshwater habitats in the Carboniferous Period (359 to 299 million years ago). Table follows the widely used classification system of Horne, D.J., Cohen, A. & Martens, K. 2002. Taxonomy, morhology and biology of Quaternary and living Ostracoda. In: Holmes, J.A. & Chivas, A.R. (eds). The Ostracoda. Applications in Quaternary Research. Geophysical Monograph 131, American Geophysical Union, Washington, DC. 5-36. For identification down to the species level it is usually necessary to dissect specimens. Dissecting something only about 1 mm in size might sound difficult, but with a bit of practice most people can master it. An excellent guide to dissecting ostracods can be downloaded for free. The most useful single publication is Claude Meisch's book on freshwater ostracods from Western and Central Europe. Even if you are studying ostracods from areas outside of Europe, this is still a useful book, because many genera and species found in Europe are also found elsewhere. Each species covered includes diagrams of the carapaces and appendages. Another essential publication is a checklist of all extant non-marine, free-living ostracods, which can be downloaded for free from the Euroepan Journal of Taxonomy. Covering 181 species, the Atlas of Quaternary and Recent Ostracods of Middle Germany by Roland Fuhrmann is another book that every ostracod researcher should have. It figures only the carapaces and valves, but each species is covered with high quality scanning electron microscopy photographs. The text is in German. The Kempf Database Ostracoda [External link] is a bibliography of marine and non-marine ostracod publications. It is very useful for looking up the original publications of species and checking for synonyms. © Robin James Smith. All rights reserved.